Neenah, WI - The effects of a hazmat incident can be devastating and far-reaching. To help ensure that all hazmat employees are properly trained according to the Hazardous Materials Regulations (HMR) (49 CFR §172.704), J. J. Keller & Associates, Inc. — the nation’s leader in safety and regulatory compliance — has developed Hazmat: Training for All Employees. Designed by J. J. Keller’s trusted in-house experts, this training program covers General Awareness, Safety, and Security Awareness training, and includes guidance to aid instructors with Function-Specific training. “This program is unique in that it helps employers train all of their hazmat employees regardless of their job function, which — in addition to saving time — will help to streamline compliance efforts,” said Michael Atkinson, hazardous materials transport editor for J. J. Keller. 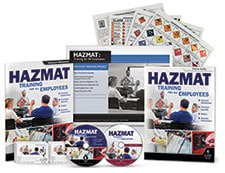 Comprised of dynamic real-life video lessons that encourage active learning, Hazmat: Training for All Employees is available in DVD, Video Training Book, Pay Per View and Online Course formats. To learn more, visit JJKeller.com/123397. About J. J. Keller & Associates, Inc. Since its beginning as a one-man consulting firm in 1953, J. J. Keller & Associates, Inc. has grown to become the most respected name in safety and regulatory compliance. Now over 1,400 associates strong, J. J. Keller serves over 600,000 customers — including over 90% of the Fortune 1000® companies. The company’s subject-matter expertise spans nearly 1,500 topics, and its diverse solutions include ELogs and mobile technology; training via online courses, streaming video or DVD; online management tools; managed services; consulting services; online and print publications; forms and supplies. Transportation professionals rely on J. J. Keller’s in-house expertise and wide selection of products and services to reduce risk and improve regulatory compliance, performance management, and operational efficiency. For more information, visit JJKeller.com. J. J. Keller & Associates, Inc.